These are my new favorite treat! You don't even need a mixer for this recipe; they are that easy! You can substitute chocolate chips to make chocolate chip cookie bars too. 2. Mix the flour, salt, and baking soda together in medium bowl; set aside. Whisk the melted butter and sugars in a large bowl until combined. Add the egg, egg yolk, and vanilla and mix well. Using a rubber spatula, fold the dry ingredients into the egg mixture until just combined; do not overmix. Fold in 1 cup of M&M's and turn the batter into the prepared pan, smoothing the top with the spatula. Sprinkle remaining M&M's on top and press in slightly. Here is the recipe doubled and baked on a cookie sheet for 28-30min. Seriously delicious! I think they are my new favorite too!! Don't you LOVE Melskitchencafe.com?? It is the best recipe blog! I stumbled upon your blog a few months ago and have made several recipes, but this is my favorite. I made a special trip to the store to buy M&Ms so I could make these for my inlaws! Such a great decision! Thanks for posting this! I just made these again yesterday, and I still love them. I meant to tell you Erica, that the one I brought you had been frozen. Bet you couldn't even tell. Jordan - Yes! There are so many great blogs and recipes out there to try! I think its probably just the name. I mean... is it a kitchen or is it a cafe? Will un leached all purpose flour work? How about wheat loud? Unbleached all purpose flour should work fine. I wouldn't try using all wheat flour, but maybe substituting a little. Could I add some peanut butter to this? If so, how much? I have never added peanut butter to these, but I'd start with 1/2 a cup and see how that works. Hi, I'm new to your blog. A friend pinned this recipe on Pinterest, and I tried it for a camping trip over the weekend. Delicious!! A fellow camper made the suggestion to pipe on some frosting like a cookie cake, so I may do that next time I make them and don't have to stack them for travel. But this one is definitely a keeper. Thanks for sharing! I love Reese's Pieces! I'll have to give that a try! Good idea to frost it like a cookie cake too! Thanks! Why does it say to separate the egg when both the yolk and whites get mixed together in the same bowl? Just curious if this is a necessary step. The recipe calls for one egg and one egg yolk...therefore, you need to add a whole egg and an additional egg yolk. Thanks for answering Jenny, you're exactly right! Hi! Do u think it Would work to double this and put it in a big cookie sheet pan? I have doubled this recipe and it worked great! I used a 13x18 inch pan and covered it with 2 sheets of foil so it could hang over the edges on all sides. I baked it for 25 minutes. Oh my, just made these for a friend who just had a baby and had to save a few for my kiddos, they are DELICIOUS!!! M&Ms are my kids' favorite candy so they gobbled them right up and asked for more! I love chewy cookies so this was a hit for all of us! Thanks for posting! If you are thinking about adding peanut butter to this recipe - try it with peanut butter m&m's instead of regular - YUM! Thank you for a great recipe! I've made your M&M bars numerous times and they are always a big hit! I love how quick & easy they are to make. They are seriously addicting!! I came across your recipe and had to try it. They were delicious and very easy to make. I think the recipe was easy to follow as well. Thank you so much. My girls loved these cookie bars and want me to try other candy in the future as well. Awesome! I made this same recipe, but used Reese's Pieces for my peanut butter loving husband. He went CRAZY for them!! So yummy! I haven't taken the time to read all of the comments, so if this has been answered already, I apologize. Has anyone made this recipe in a 9x9 pan to make the cookie bars thicker? If so, for how long did you bake them? They are still cooling, but I confess that I cut a small piece from one corner and tasted them already--yummy! And, the house smells great. I might need to make these again soon. Everyone makes them sound so good! I have never tried to bake them in a 9X9 but I would just increase the baking time by about 8 minutes. Make sure the top doesn't get too brown though. Cover it with foil if it does. A good source to help with figuring out baking times is a brownie box. It usually says how long to bake brownies for different sized pans on the back of the box. You can kinda go by that. these look delicious!! just wondering with the butter is it meant to be completely melted or brought to room temperature then creamed with the sugar? Can you use peanut m&m's? Do you think it would work if I cut mint truffle kisses in halves instead of m&m's? Yes! I've made this many times with plain old chocolate chips. The mint kisses would be yummy, just a little bit bigger chunks of chocolate. I just tried making this and (keep in mind that i can't even bake the premade cookie dough you find in store) it came out amazing! I'm so glad i found this super easy super delicious recipe! That does it!! I am totally making these today! These sound so amazing! Way to go, Christine!! I can't find baking soda in my house. I am using self rising flour so is bading soda neccessary? Or would baking powder work? LOVE IT! I used peanut butter M&M's instead and they were amazing! I made a 1/2 batch yesterday with my 3 yr old, and they were amazing! I will say getting a half an egg and half an egg yolk was a little tricky, but I did not need an entire 13 X 9. Will definitely use this again for family functions! These are by far my favorite cookies to make! Just made them for the fifth time for softball tonight. Thank you so much for such an amazing recipe! DELICIOUS! These were perfect as is. However, I am going to try and put scoops of the dough in mini muffin tins and top with frosting for a school treat. Easier for the teacher to serve the kiddos in that form, I think. I'll let you know how that works. Will DEFINITELY make these again. I linked you to my blog. Hope that is okay. Hi! These look delightful and I am thinking of making this for my son who doesn't care for cake (seriously, who doesn't like cake? I feel like I have failed some how) as his birthday teat. Have you ever made these in a pizza pan? As a cookie cake? Would I need to double the recipe? Or do you have any idea about cooking time? Thank you! I'm glad everyone is enjoying these! I made them with peanut butter M&M's last week and they were so good! @Sarah B I have doubled this recipe and used a 13x18 inch pan. I baked it for 25 minutes. I have never baked it on a round pizza pan, but I'm sure it would work. You'd just have to keep an eye on it when baking, and possibly double the recipe if using a large pan. I haven't used frosting on top either, but someone commented previously and suggested piping frosting on top. I think it's a great idea! Thank you! I am giving it a try this weekend (decorated as a huge red angry bird) I will let ya know how it turns out! HI! Found this recipe on Pinterest. The directions are clear and they were very easy to mix together. They are in the oven as I type. I hope they turn out as good as they look in the pictures you have. One question: What is the purpose of the tin foil in the pan? Easier to get them out and not have to wash the pan, or is it something with the baking process. I found the foil to be a bit of a nuisance...ripping and not staying put while trying to put in in the pan and spreading the batter in. Do you have to use it? To add to my previous comment: Result - they turned out cakey. I have also had this problem with other cookie bar recipes I have tried. Any tips? @SarahM I don't think lining the pan with foil makes a difference in the baking. It's just easier to remove and cut the bars when you use it. Sorry they turned out cakey! That has only happened to me once and I have made these many times. I left them in the oven too long and they were overdone in the center. Try decreasing the bake time when you make them again. Also, if you are baking at a high altitude that could make them more cakelike. I made these this evening and baked them for almost a full half hour. Is the inside supposed to look almost like raw cookie dough? They are delish but I just want to make sure I baked them long enough because they don't look all the way cooked. The middle will look a little underdone, but if you wait for it to cool completely before cutting, it will be be firm and not gooey. Just made these last night. They're amazing! i hope they turn out nice i will be baking them soon any tips christine that would help me they look scrumptious in the pic! Just made these tonight, and they were soooooo good! I featured these on my blog, All You Can Chew, and linked to your blog. If you get the chance, please stop by! I'm a pretty new blogger, so any views help! Thanks! @Asra Asim I can't think of any more tips. Hope they turn out well for you! @Abby Thanks! I will definitely check out your blog for new recipes to try! Hi, my sister is allergic to eggs so is there something else i can put instead of the eggs? Usually, for chocolate chip cookies, I just add apple sauce and no one knows the difference. @Juee I have never substituted the eggs in this recipe, but you can find many ideas for egg substitutes online. Here's a link that will be helpful: http://chefinyou.com/egg-substitutes-cooking/. BIG hit at superbowl party. I used white whole wheat flour because that's what I had, and before adding the M&Ms I had to add 1/8 c water to get the dry ingredients fully incorporated. The water brought the dough to the consistency of cookie dough. They're still in the over, but I'm optimistic! Can I substitute vegetable shortening for the butter? I really want to make these, but don't have butter available now. I make these all the time. so good!! Made these this morning. Glorious! Do you mind if I post on my site www.justaranchwife.com ? Any advice on how to adjust these for high altitude baking at 6500 feet? Thanks! these are so quick, easy, and tasty!!! Have some baking right now. This will be my 4th time in 2 months to make these after finding them on Pinterest. Thanks! I'm a little behind on reading my comments! @Sarah Besser I wouldn't try shortening because you have to melt it and it just wouldn't be the same. @Anonymous Feel free to post to your blog. So glad everyone is loving these! I have made these twice and LOVE them!!.. once with regular M&M's and once with pretzel M&M's... pretzel ones are now my favorite!! Thank you for such a great recipe!! My mom made these when I was a little girl so I was happy to find your recipe on Pinterest. I have made these several times as they are always requested. Today however I doubled the recipe and used macadamia nuts and white chocolate chips. I have to say they are just as delicious as with the MnMs, but my daughter wanted the nuts and chips. Either way these are now my "go-to" cookie. Thanks!!! I tried making this and i followed the recipe exactly, but mine turned into a watery mess :( I dont know what i did wrong. Sorry it didn't work out for you! I've never had that problem, so I'm not sure what might have happened. I just made this recipe and I had to leave a comment. These cookie bars are toooo good - they turned out soo delicious. Thank you for sharing the recipe! Not that impressed. I love M&Ms.This. was a disappointing recipe. This is a favorite. I love it for all the bake sales coming up... so much faster to send bars instead of plopping out 4 dozen cookies... mama ain't got time fo' that! I almost always just use chocolate chips. Best advice is don't over mix and don't over bake. We need a break from the pear and apple goodies. These are getting whipped up now. I'm sending a package to my son at college and since this is one of his favorite recipes that I made last summer I'm going to be making these for him this afternoon. Thanks for the recipes. I'm hoping bar cookies will package up and mail easier than traditional round cookies. These are amazing and wonderful!! I was looking for a yummy recipe to make for my boyfriend's parents as a house warming gift and stumbled upon these. I made a batch a few days before I was going to bring them some, to test them out on my parents and my brother. Well, they devoured the entire pan in a day! I am making more as we speak, and this time I used Reese's Pieces because I liked the fall colors. No time to make cookies, and wanted to try a new basic bar recipe. Found one that looks like I will use again! Thank you! @Anonymous Are you measuring your oven temperature in Celsius? Most ovens go up to about 450 degrees Fahrenheit which is the same as 230 Celsius. All of my temps are in Farenheit. If your oven only goes to 230F I don't know what to tell you. If you bake something longer at a low temp it will dry it out. Recipes just won't turn out the same. Good luck! It's in Celsius. So can I use 210 Celsius and bake it like yours? Thanks now I understand why my last cookies didn't turned out like I expected. These are a favorite in our house!! I've made them numerous times since finding the recipe on Pinterest. The first few times I made them, they were delicious but undercooked. I finally realized that I needed to up the temp to 350. At 325, I could have them in there for 45-50 minutes and only the edges would cook. At 325, they just won't cook in my oven. I am the kitchen maid for 4 little eaters and 1 manly eater. 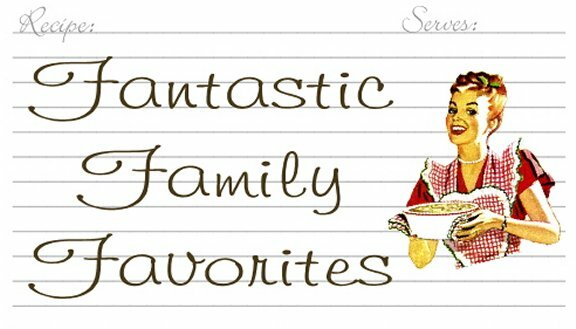 I started this blog to organize and share some of our family's favorite recipes. I love finding new recipes to try, and hope they become favorites too!